يتميز تطبيق Storyo بقدرته على إنشاء عروض الفيديو السينمائية بشكل تلقائي باستخدام صورك الخاصة الموجوده على جهازك بالإضافة إلى الموقع الجغرافي الخاص بالصورة وتاريخ التقاطها، حيث يقوم التطبيق بعرض كل هذه المعلومات جنباً إلى جنب بطريقة مميزة وأنيقة. ويُمكنك ايضا إضافة موسيقى او صوت من اختيارك كما يمكنك تحرير وتنسيق النصوص والكتابات وإضافة المؤثرات عليها وضبط الانتقالات والحركات بين الصور والنصوص، كما يتيح لك التطبيق إمكانية إضافة الفلاتر على الفيديو وذلك عن طريق الاختيار من مجموعة فلاتر مميزة وفريدة من نوعها داخل التطبيق. Flipagram, Animoto, and Storehouse, step aside! Storyo users from 170 countries around the world have created more than a half million stories and counting. Xammy Award Winning Mobile App by Xamarin (a Microsoft company). 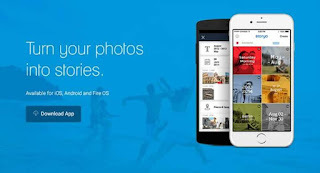 Storyo splices your favorite memories together into videos, automagically, from your slideshow collection of photos. You’ve got your own videoshop to create stories from your experiences in seconds with just a few clicks. We built Storyo because some memories deserve a real story with a real video story maker. Whether it’s a family get-together or your favorite travel photos, you can enjoy and organize your lifetime collection of memories with this amazing AI-driven movie maker. Who knows who might make a cameo in your hit production? 1- Take pictures as you normally do, ideally with your location enabled. 3- Done! Share your storyo right within the app, save it or export to a movie file. In just one tap, have stunning videos with Storyo - the first meta-storytelling application in the world that combines photos and data (like maps and location) to create beautifully simple video stories that can be easily shared. 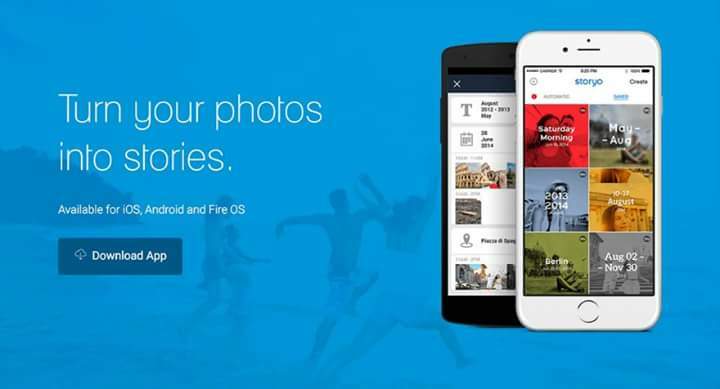 By searching your photos automatically, Storyo finds the stories behind them, establishes a timeline and then fetches the web for elements to help tell those stories in rich, meaningful and unique videos. Real storytelling with pictures for you to enjoy. 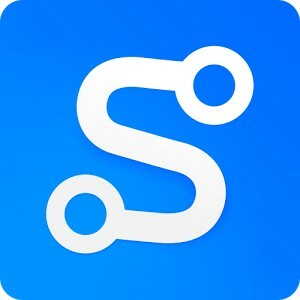 Instantly spectacular storyos: Get ready-to-watch movies from your photo library with just a few clicks, in merely seconds. Automatic process of selection, cutting and trimming: Just choose a period of your best memories and let Storyo create a movie for with its automated narrative generation algorithm. Choose between several unique and awesome filters and transitions: Flip, Matik, Blurd, Blunote, Noir and Parallax. Automatic Stories: with this super feature, discover new and fantastic stories based on your photo activity.